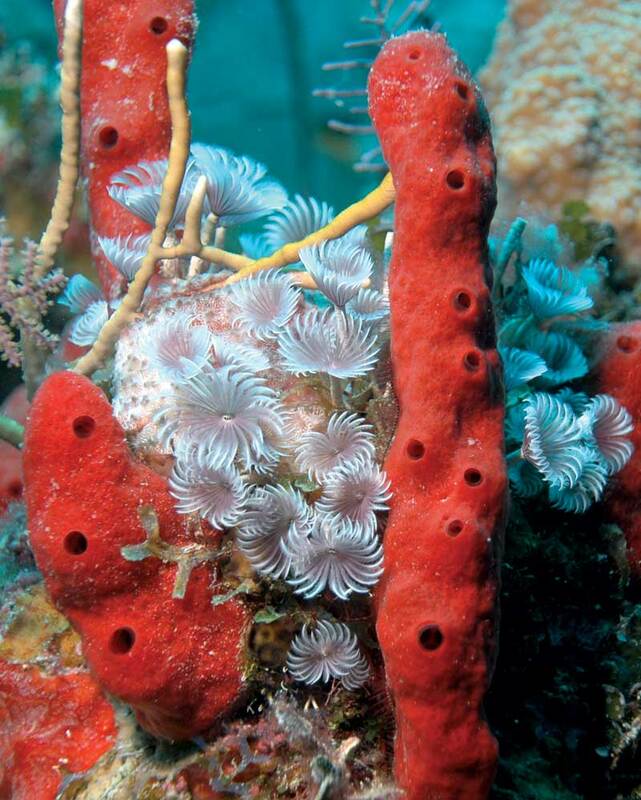 Understanding what happens to light underwater brings new appreciation. If you’re lucky enough to be around any of the Turks & Caicos’ legendary coral reefs on a sunny day and peer down into crystal-clear turquoise waters, you might think you’ve stumbled upon the world’s largest natural aquarium. The hundreds of species of corals and sponges are dazzling, and the tropical reef that calls them home is just as flamboyant. Blues, greens, reds, pinks, oranges, yellows, indigo: It’s the original rainbow coalition! Red rope sponges give a nice contrast to the delicate lavender and white social featherduster worms. So it’s rather shocking when you dip beneath the surface and join these magnificent creatures on their turf (the primary motivation of the legions of us passionate scuba divers) and discover that the colors change the deeper you go. And not only do they change, but if you go far enough, they actually disappear. This is physics at work. Light emanates from the sun, and direct light from the sun is called white light. While in the air, it doesn’t appear to have any color at all, and yet we all remember a certain Roy G. Biv (Red Green Blue) from science class and the first time we observed light through a prism. At some point in one’s scuba training, they’ll hear about the diver who cut his finger 40 or 60 feet below the surface and the blood looked green. It’s true—and it’s because we “lose” color in the order it appears in the spectrum. As you’ve surmised, red is the first disappear, at depths of approximately 15 to 30 feet. Next we lose orange, between 25 to 40 feet, then yellow (45 to 60), green (around 70), and by the time we hit 100 feet, most everything will appear blue or grayish green. So, it’s a bit like the famous philosophical inquiry: If a tree falls in the woods and no one is around to hear, does it make a sound? If I’m diving at 80 feet at Amphitheater with Barbara and her photography equipment but no lights or special lenses, are we surrounded by bright color or not? 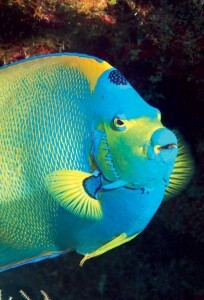 The queen angelfish with its vivid turquoise blues and yellows is a colorful star of the coral reef. Even though yellow starts to be absorbed by 35 feet, it still has an eyecatching brightness when seen in ambient light at 80 to 100 feet. Any diver can relate to that. Swim through a dull-looking (but coral-encrusted) overhang and shine your dive light on any section and you’ll be treated to an entirely different view. I’ve dived plenty of walls and swim-throughs around the world, and make a point of always carrying a small light in my pocket for just those occasions. Flash the beam and gawk at wall-to-wall gleaming, glowing kaleidoscopic colors! White-spotted filefish will change back and forth between the phase you see here and one covered with bright white spots. A few dive mask manufacturers sell a special pinkish-magenta lens that filters out blue wavelengths in the water and allow divers to see the vivid reds, oranges, yellows and greens that are lost as they descend. This is one time that it’s actually beneficial to see the world through rose-colored lenses. At night, it’s a whole different story. Once the sun sets, of course, we lose all the colors in the ocean. But we gain something special: bioluminescence, or the natural production and emission of light by an organism, something that 90% of marine creatures do, to varying degrees. It’s like swimming through a dark sea of fireflies—and then there are the pink eyes of the nocturnal critters, like shrimp, prawn and lobsters. But by far and away the coolest thing I’ve done (sadly, it’s not available in the TCI—yet) is what’s called a Fluorescence, or Fluoro, Night Dive. A number of people have likened the experience to being in the 3-D movie Avatar. Done (obviously) in the dark, experienced divers, led by a local guide, will put on special masks with yellow filters and bring down special UV lights that, when shined on certain fish and corals, will make them appear to “glow” like neon. While this isn’t a realistic version of the underwater landscape, it’s a good reminder that things aren’t always what they appear. 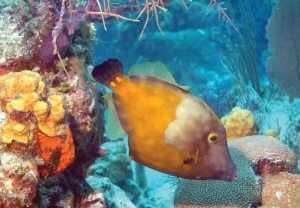 And when it comes to fish and corals, you can’t have too much of a good thing.